In a way, sailing made its Games debut at Sydney in 2000, when it became the first Olympic sport to change its name. Up until then it had always been called yachting and it was under that title that it was introduced in 1900. Bigger boats, with as many as 10 to 12 sailors, dominated the early Olympics, but since 1924 the trend has been towards smaller, one-design boats with fewer crew members. At the 2004 Games in Athens, only one event - Yngling - had a three-person crew and lone sailors contested five events. The current Olympic programme features a mix of boats. Some - like the 49er - reflect design and technology advances, while others - like the Star and Finn - have a long and distinguished history. Men and women have always competed side-by-side in Olympic sailing, but since 1988 there have been sailing events exclusively for women. 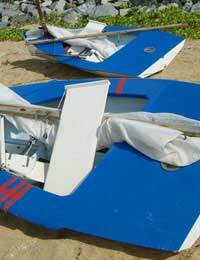 The Olympic sailing programme in Beijing included four men's, four women's and three open events: the men's 470 two-person dinghy, RS:X windsurfer, Laser one-person dinghy, Star keelboat, women's 470 two-person dinghy, RS:X windsurfer, Laser Radial one-person dinghy, Yngling keelboat, mixed 49er skiff, Finn heavyweight dinghy and Tornado multihull. Fleets of well-matched boats - identified on the water by national flags on sails and the crew names on the mainsail - race around courses that incorporate various sailing angles and are designed to test upwind, downwind and reaching techniques. Events consists of a 10-race opening series - 15 for the 49er - with each race governed by International Sailing Federation (ISAF) rules and scheduled to last between 30 and 75 minutes depending on the event. Scores are awarded according to finishing positions in each race, and the 10 leading boats at the end of the opening series qualify for the medal race, held on a shorter course. Points scored in the medal race are doubled and added to the opening series' scores to decide the top 10. The power of the wind and the waves has been harnessed as a means of transport since antiquity, but international yacht racing began in 1851 when a syndicate of members of the New York Yacht Club built a 101-foot schooner named America. The yacht was sailed to England where it won a race around the Isle of Wight for a trophy called the Hundred Guineas Cup. The trophy was renamed The America's Cup and it remained in the hands of the United States of America until 1983, when an Australian yacht, named Australia II, finally brought to an end the New York Yacht Club's 132-year winning streak. The first step in developing the worldwide sport of sailing was the creation of the International Yacht Racing Union in 1907. Sailing has developed rapidly over the last 100 years, aided by an ever-increasing range of materials and designs. Mass-produced, one-design boats have seen the sport spread to all corners of the globe, while the development of multihulls, skiffs and windsurfers has pushed back the boundaries for sailing's thrill-seekers.